This splendid dagger is made from silver. The fluted handle leads to a robust lion’s head, its detailed mane finely textured and its eyes being rubies fixed within gold settings. The chiselled bolster is beaded and made from iron, and it leads to a gracefully shaped, unfullered blade of wootz steel. The velvet covered scabbard is equally as impressive: the chape and locket have stylised lily flowers that float against a textured ground while delicately styled fronds emanate from their borders. Concluding the scabbard is a curling bud finial. The lion’s head can be removed to reveal a container into which it is said opium was stored. Despite lacking a typical silver mesh on the grip, the artistic elements of the hilt and scabbard help us to identify that this was probably made (or at least greatly influenced) by a silversmith of Jalandhar, a town in the Punjab. 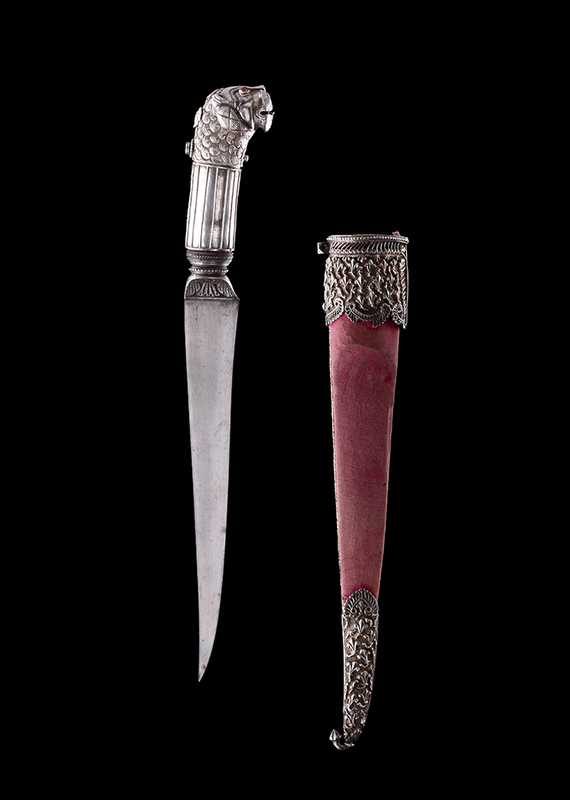 The armouries at Jaipur and Jodhpur both also have multiple examples of this weapon-type—so it is possible that the Punjabi silversmith was hired by the Rajput maharajahs to make these intriguing daggers for them too. R. Elgood, Rajput Arms & Armour Volume II, Niyogi Books, 2017, p.103, p.765.